Hello friends! 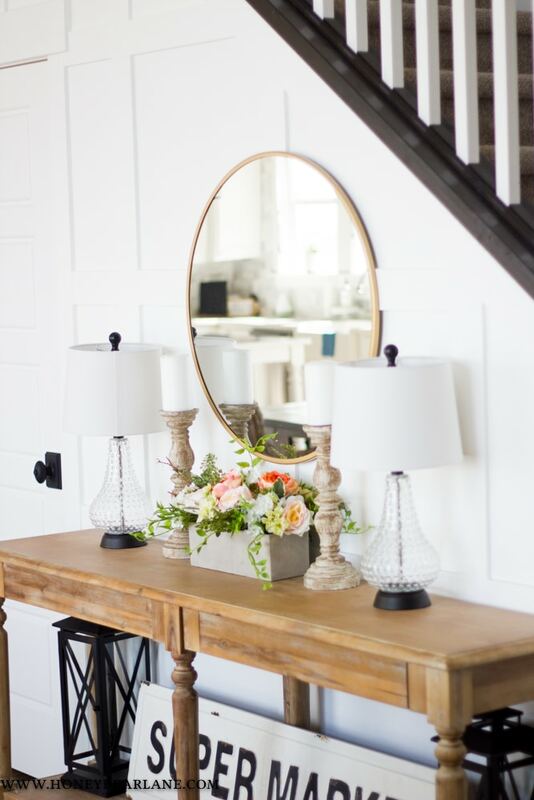 I’m so excited to be sharing my spring home tour with you all today! 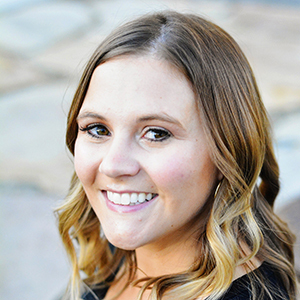 I am privileged to be able to be part of the Balsam Hill spring tour bloggers and I find myself in some amazingly talented company. 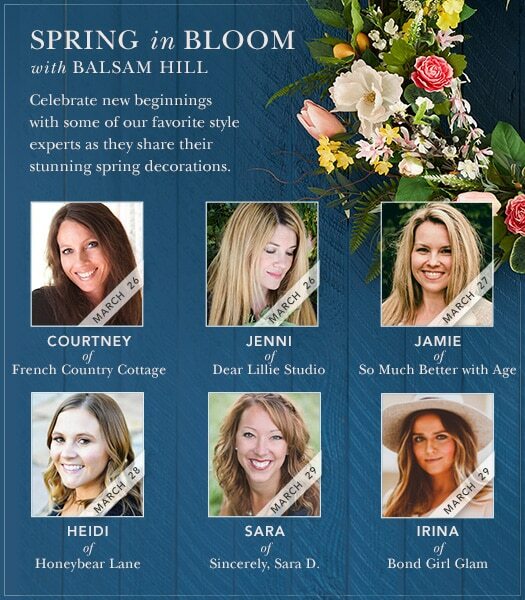 The ladies in this group have impeccable taste and gorgeous homes so really, I’m so honored to be included. I hope you will check them all out! And of course a HUGE thanks to Balsam Hill for providing me with some truly beautiful floral pieces. 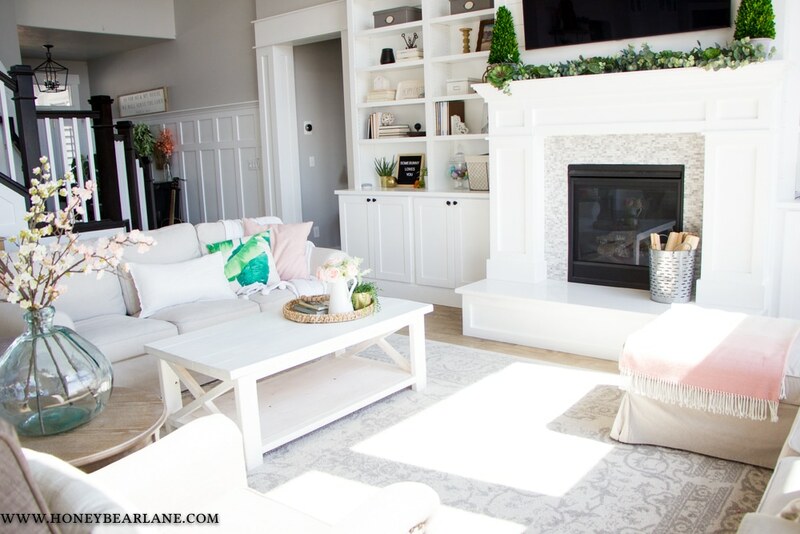 I hope it inspires you to decorate your homes for spring, even if it is still snowing a little bit outside like it has been for me! Let’s start with the front porch. My front porch is not decorated at all for spring yet because of the aforementioned snow, but I’ll be sure to show you my pretty flowers when they are blooming here in a month or two. That is hands down my favorite part of spring, and it really gets so much more fun when you take the time to plant lots of pretty things and see them come back each year! 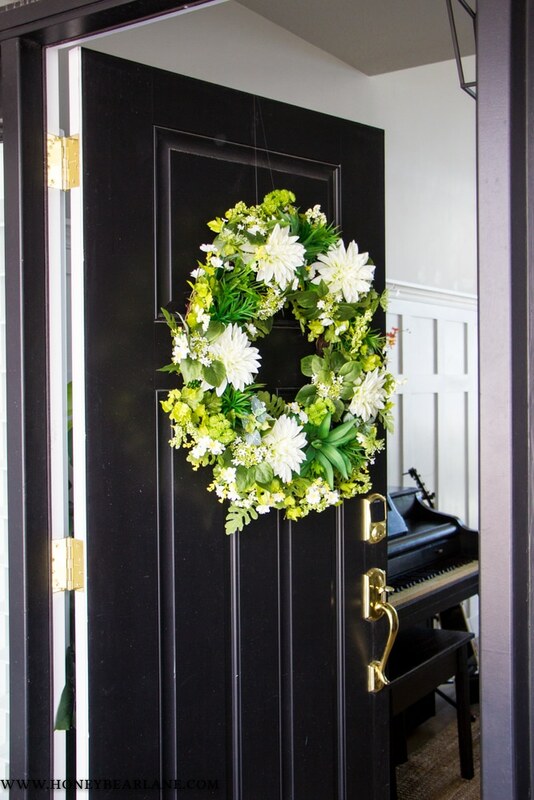 I did put a pretty springy wreath on my front door which makes me happy every time I drive up to my house. Since I’m currently working on my front room, we have moved our piano out to the entryway. 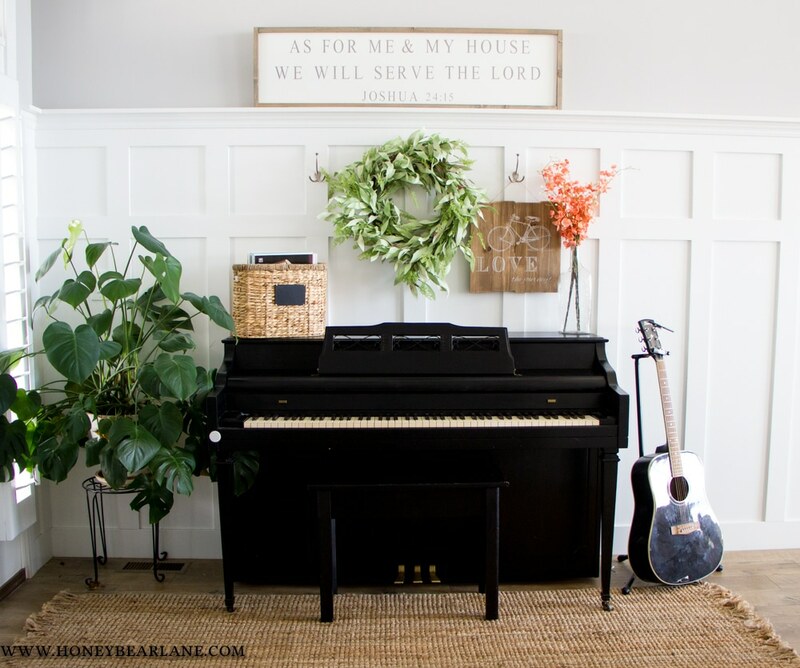 I actually love the look of the black piano against the white board and batten! But it does make kids’ piano practicing time much louder, haha! 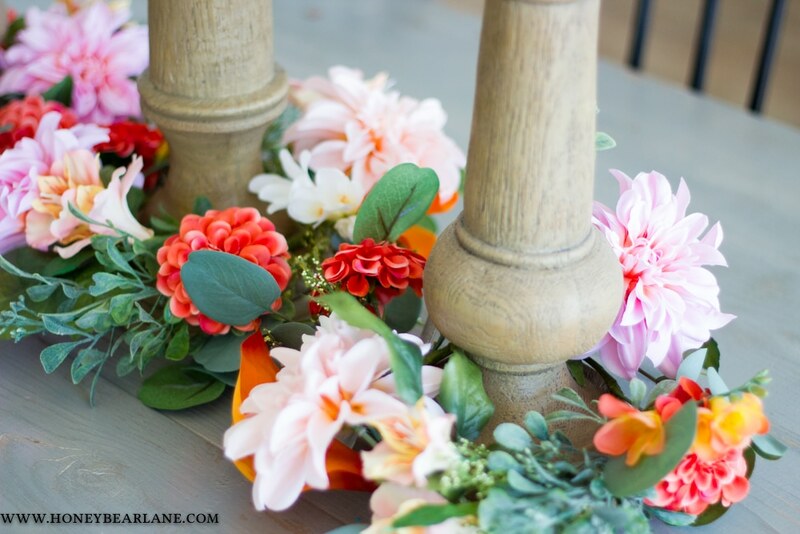 I hung a simple green wreath on a hook and placed some pretty coral flowers in a vase. I love coral and it’s definitely one of my spring colors this year. I also love that I switched out the rug a few years ago from a patterned one to this jute one. The jute one catches so much more dirt but you can never tell it’s dirty and has held up to all the stuff people track in. 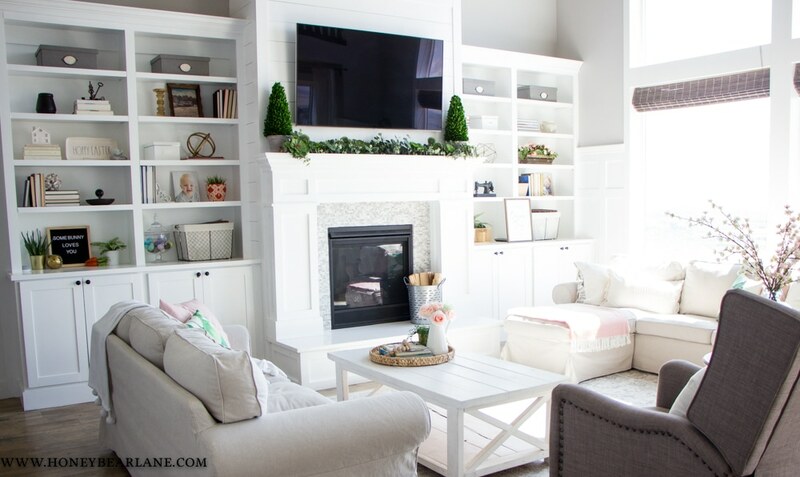 I also love the neutral/farmhouse look of it. After the entry you immediately enter the family room which is a two-story room and super open. It makes it hard to photograph actually. 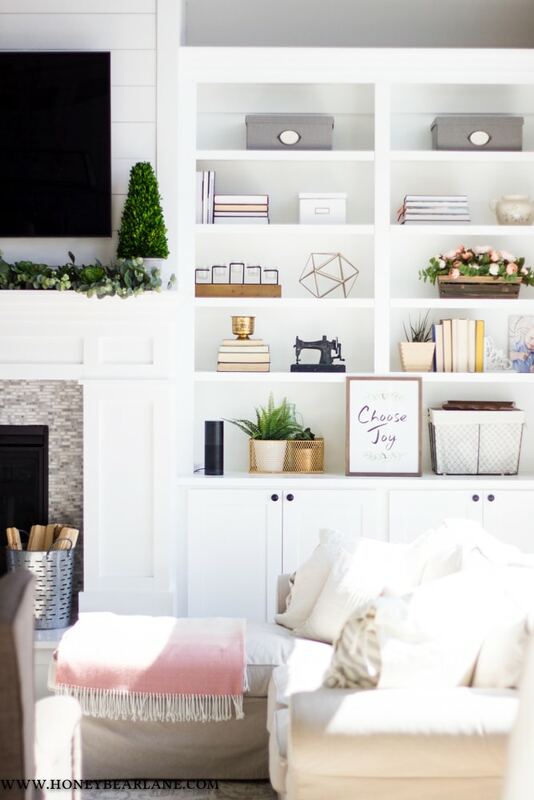 Last fall I added these built-ins to the family room and they are the BEST thing I’ve ever done to my house. They have taken this space up a huge notch and it’s fun to switch out the decor here and there for seasonal items. 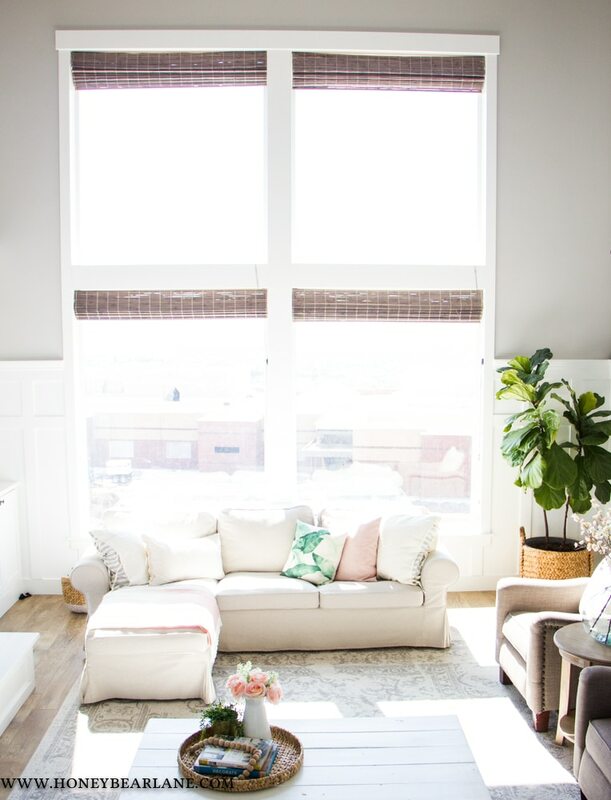 I’ve changed up my neutral pillows for some fun pink and green leaf ones and it really adds some life and color into the room. 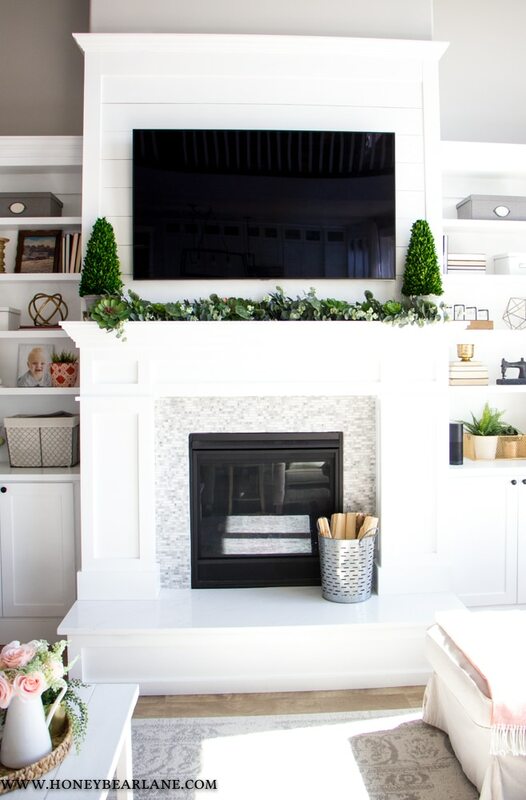 I also love having little floral arrangements and even the succulent and eucalyptus garland from Balsam Hill on the mantel adds a ton of life into the space. Some people aren’t fans of faux florals but I love them. They’ve come a long way in how realistic they look (the Balsam Hill ones looks SUPER realistic!) and they are zero maintenance and never die. So that’s a win-win! They add so much color and whimsy so my house and when it’s dead and cold outside that’s exactly what I need inside my house. I love being able to bring spring in my house even in January. I love this English rose spring arrangement right here on my console. 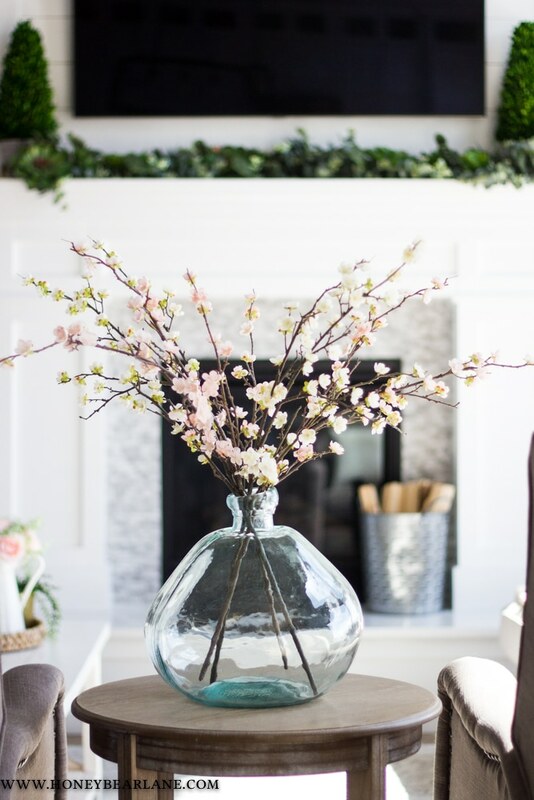 I love these blossom sticks I found and added to my balloon vase from World Market. They really say spring to me but unfortunately we don’t have any blossoms on our trees yet. I live in a windy part of the state which makes spring come even later that at my mom’s house which is only 20 minutes south of me. I love living here but that is definitely the biggest drawback! I pulled out my Balsam Hill candle holders and LED candles from the Christmas tour and they were the perfect things for these pretty floral candle rings. You can put them around the top of the candle holders or down at the base like I have. I like them both ways but they made the candles seem a little more top heavy when they were at the top and I was nervous my toddler would climb up and tip them over. They really brighten up the table though without being a super busy centerpiece. 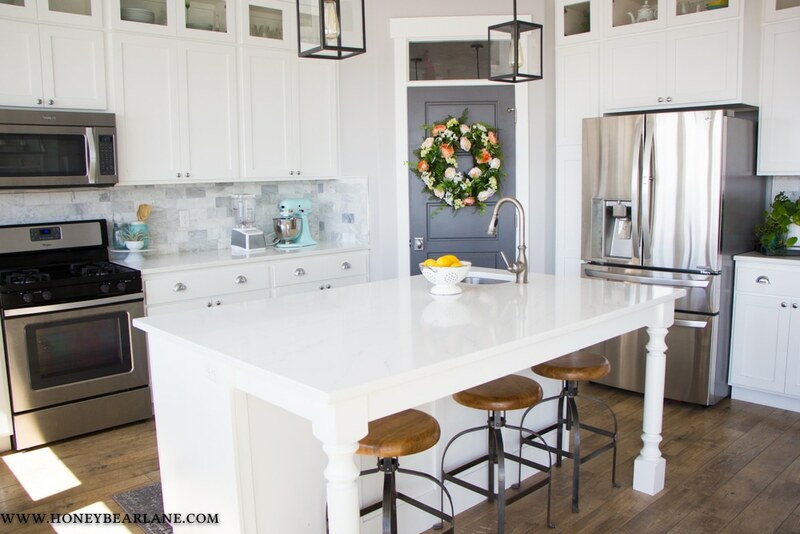 The whole kitchen was decorated with just two things–a wreath on the pantry door and a bowl of fresh lemons on the island. 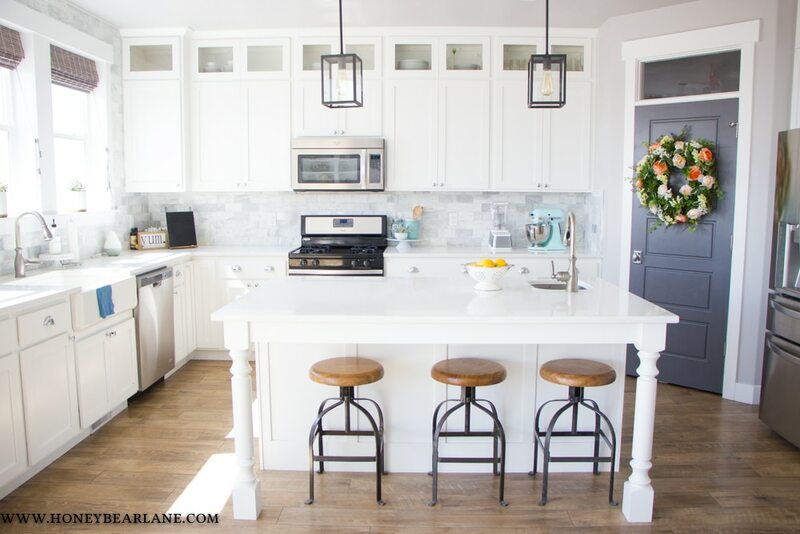 I love keeping my countertops as free from clutter and decor as possible and adore the look of the clean simple kitchen. But I absolutely love that I painted my pantry door last year and made it pop out in the space and donned with a pretty spring wreath it just looks gorgeous. Sometimes I just feel so blessed and lucky to get to live in my dream house already! 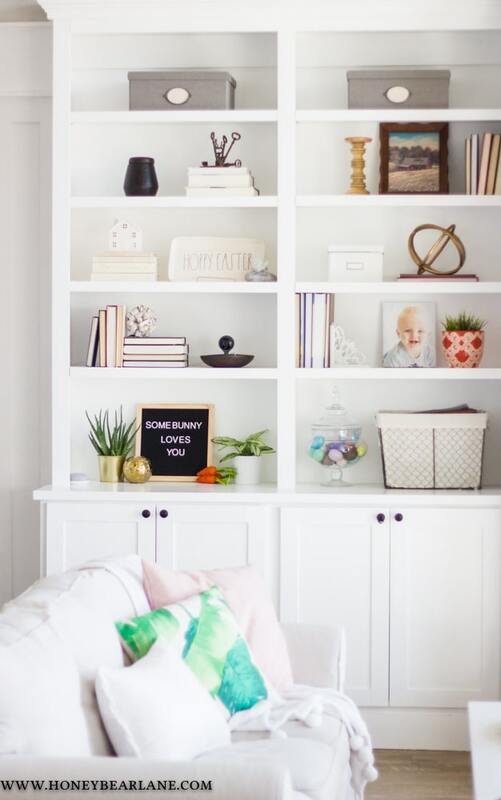 That’s all for my spring home tour but I hope you’ll take a second to leave a comment and tell me your favorite thing to decorate with in spring! And please visit the other home tours this week as well, they are all fabulous! 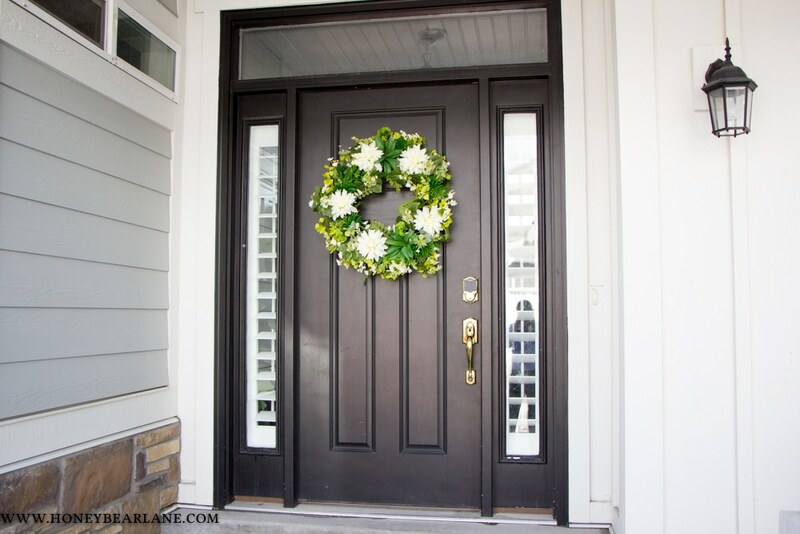 And right now Balsam Hill is having a giveaway for a decorating package which includes a wreath, window box, potted foliage, hanging basket, mailbox swag and more! Just head over to their Facebook page to enter! 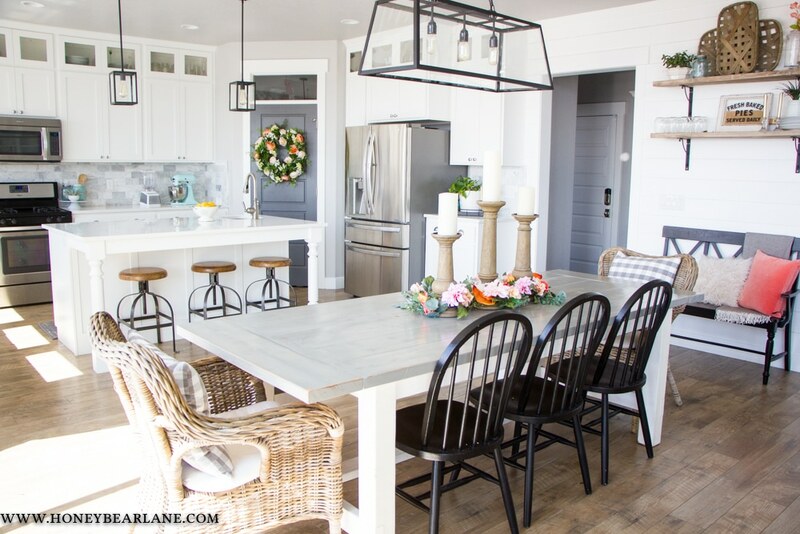 Gorgeous kitchen, girl! Happy to be in this spring roundup with you. 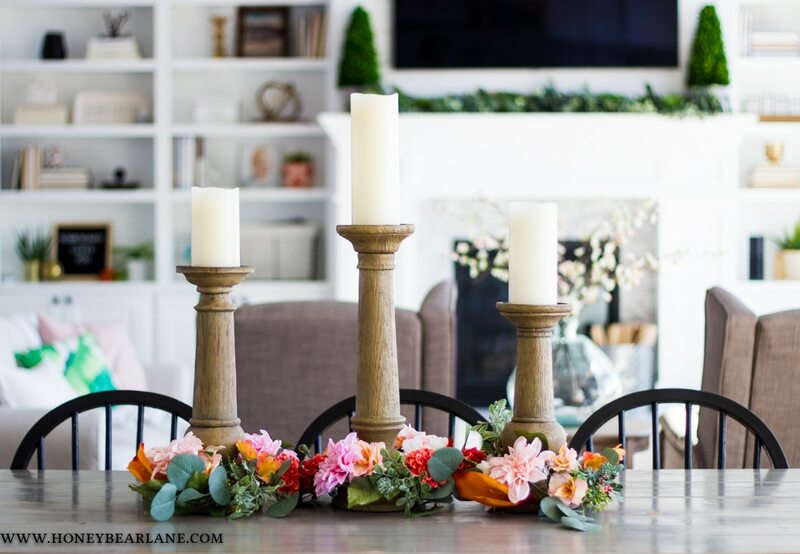 Your home is beautiful and I love the new florals especially that one on your console and the candle rings are so pretty too! Really nice! You have a lovely home. 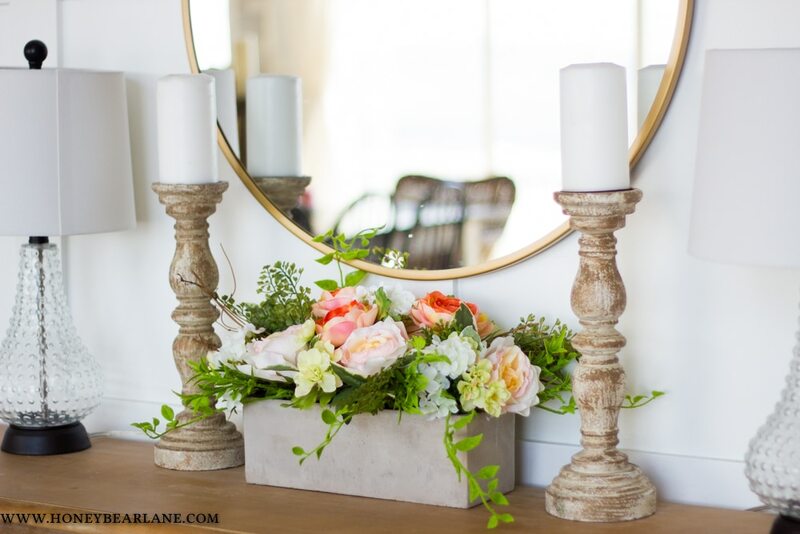 I am not usually into faux florals but the ones you chose and how you placed them is just beautiful. I especially love the wreath on your front door. Very nice. I like your candle holders. Pretty home.